throughout China with the Oakland Youth Orchestra. In 1996 he served as a substitute with the Marin Symphony Orchestra.Michael attended the Blair School of Music at Vanderbilt University, where he earned a Bachelor of Music in Percussion Performance. During his time at Vanderbilt, he studied with the Principal Timpanist of the Nashville Symphony Orchestra, William Wiggins. Michael Passaris decided to further his musical studies by attending Carnegie Mellon University, in Pittsburgh, PA where he earned a Masters of Music and a Postgraduate Certificate. While at Carnegie Mellon, he studied with Timothy Adams Jr., principal timpanist of the Pittsburgh Symphony, and Paul Evans, free-lance musician and percussionist with the River City Brass Band. While at Vanderbilt and Carnegie Mellon, Michael played with various ensembles including the Orchestra, Wind Ensemble, Percussion Ensemble, Contemporary Ensemble, Marching Band, Jazz/Big Band, and a variety of musicals such as Guys & Dolls, Crazy for You, Smile, Once Upon This Island, and Urinetown. Throughout his term at Carnegie Mellon, Michael played with a number of professional ensembles including the River City Brass Band, Brevard Music Festival Orchestra, River City Percussion Trio, Pittsburgh Opera Center, McKeesport Symphony, and USAF Heartland of America Band. 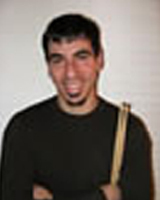 While in Pittsburgh, PA, Michael joined a Latin rock band Sauce playing percussion. He performed with Sauce throughout the Pittsburgh area as well as in surrounding areas. They were televised on public television and broadcast on Pittsburgh radio. Upon returning to his roots in the Bay Area, Michael is actively teaching and has performed with the Berkeley Opera, Sacramento Philharmonic, Napa Valley Symphony, and the San Francisco Lyric Opera. He also plays percussion with Peck the Town Crier, a local band. Michael lives in Benicia with his wife Meredith, also a musician.